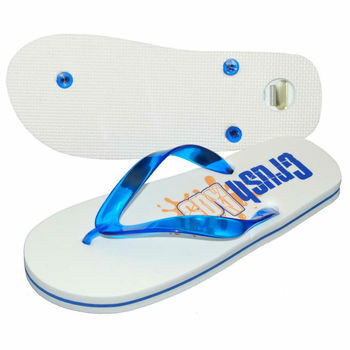 Key Largo flip flop sandal includes a built-in bottle opener in the sole of the flip flops with vinyl straps. The perfect accessory for your next beach party, or any event for that matter, our Key Largo flip flop sandal includes a built-in bottle opener in the sole of the flip flops, ready to pop the top of your favorite "soda." It features a 3-layer sole and vinyl flip-flop straps, all which can be mixed and matched to create your own custom sandals. Options: .50(v) per color or location, setup $45.00(v) per color or location. Max 1-color on straps, 2-colors on insoles. Rush Service: 5-6 Days, $2.00(v).